With Readly you can read Can A Cow Jump? and thousands of other magazines on your tablet and smartphone. Get access to all with just one subscription. New releases and back issues – all included. How much does the sky weigh? How do fish sleep? Why do boomerangs come back? 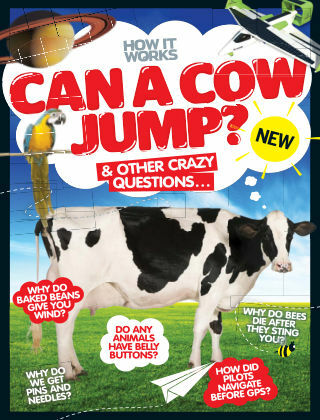 These are just a few of the questions asked and answered in Can a Cow Jump? In this bookazine we’ll investigate some of the craziest questions around, diving into the science behind each and providing you with enough fascinating trivia and knowledge to last a lifetime. So, can a cow jump? Find out here! Featuring: Science - Find out how old your body is, why habits are so hard to break and why we can’t cure the common cold. Environment - How do flies walk upside down? Are cats smarter than dogs? Can oysters really be both male and female? We have the answers. History - Delve back through history to find out why there are seven days in a week, how Everest was first scaled and more. Space - Explore the furthest reaches of the universe and discover what would happen if you fired a gun in space and why the Moon is shrinking.